No one stands between Son and Mother. … Accept, then, my good-will, which is greater than my capacity, and give us salvation. Send us the illumination of the Spirit. Inflame us with the desire of thy son. Render us pleasing to Him, so that we may enjoy happiness with Him, seeing thee resplendent with thy Son’s glory, rejoicing forever, keeping feast in the Church with those who worthily celebrate Him who worked our salvation through thee, Christ the Son of God, and our God. To Him be glory and majesty, with the uncreated Father and the all-holy and life-giving Spirit, now and forever, through the endless ages of eternity. Amen. Thanks to Reader Daniel Rudder for sending this on his mailing list. “Mary hath chosen that good part” and “blessed are they that hear the word of God and keep it.” Dormition of the Theotokos. Synopsis: The usual reading for feasts of the Mother of God is actually a composite reading in which she does not appear at all, but another "Mary" (the sister of Lazarus) is mentioned, who shares her name. The reason why is because this selection, coupled with a later part of the same Gospel succinctly sums up the virtues of the Theotokos: "Mary hath chosen that good part" and "blessed are they that hear the word of God and keep it." On this great day, let us examine ourselves, as to whether we have also chosen that good part, and kept the word of God. This is why we venerate the Most Holy Theotokos with such love; our veneration is in vain if we do not also emulate! Let us examine how we can accomplish this. Luke 10:38-42; 11:27-28 38 Now it came to pass, as they went, that he entered into a certain village: and a certain woman named Martha received him into her house. 39 And she had a sister called Mary, which also sat at Jesus' feet, and heard his word. 40 But Martha was cumbered about much serving, and came to him, and said, Lord, dost thou not care that my sister hath left me to serve alone? bid her therefore that she help me. 41 And Jesus answered and said unto her, Martha, Martha, thou art careful and troubled about many things: 42 But one thing is needful: and Mary hath chosen that good part, which shall not be taken away from her. 27 And it came to pass, as he spake these things, a certain woman of the company lifted up her voice, and said unto him, Blessed is the womb that bare thee, and the paps which thou hast sucked. 28 But he said, Yea rather, blessed are they that hear the word of God, and keep it. In thy dormition thou didst not forsake the world, O Theotokos. and by thine intercessions dost thou redeem our souls from death! We began our Church School program for 2011-2012 on Sunday, August 14th. We will be running three regular classes this year, in addition to the year-round preschool class during the Sunday homily. All three classes will take place at approximately 12:45 on Sunday afternoons, after we have had some time to get something to eat. 1. The Elementary School class, for children in grades 1-4 or so, will meet on the 1st, 2nd and 4th Sundays of each month. Matushka Marina will teach this class. 2. The Middle School class, for children in grades 5-8 or so, will meet on the 1st and 3rd Sundays of each month. Dn. Nicholas will teach. 3. The class for adults and teens will meet on the 2nd and 4th Sundays of each month. It will focus on the fundamentals of the faith — the Creed and the Lord's Prayer — and their meaning for our daily lives as Orthodox Christians. Dn. Nicholas and Fr. Seraphim will teach. We will be holding our annual membership and pledge drive in September. If you consider St. Nicholas your parish home, please consider filling out a membership form. In addition, new and continuing members are encouraged to fill out a financial pledge form. This is a good-faith estimate of your monthly contributions for 2012, so that the treasurer can generate a relatively accurate budget for the year. Sunday 8/28. 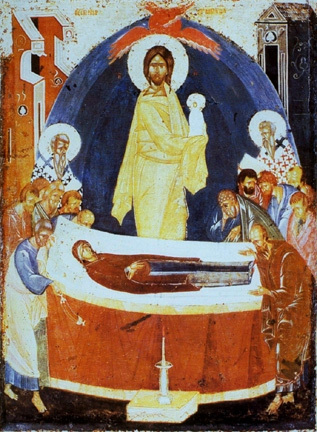 Dormition of the Theotokos. 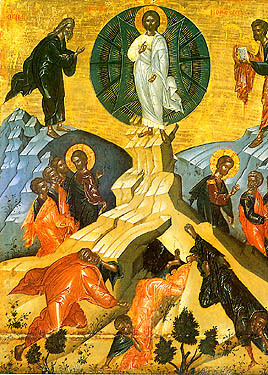 There is no fasting on the feast of Dormition, Sunday 8/28, and after this we fast as usual on Wednesdays and Fridays only. Here is a short talk about the Dormition of the Theotokos. The intercession of the Theotokos. The heresy of the Theotokos as "co-mediatrix"
The heresies of The "Immaculate Conception" and "Original Sin" are discussed at length. VERY IMPORTANT! The ever-virginity of the Theotokos explained. 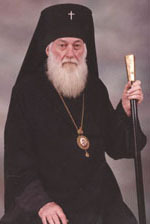 Dormition Troparion, Kontakion & Exapostilarion, sung at St Nicholas. We can learn almost everything that we need to know from listening and praying in the services. The entire troparion is explained. New for the old, and old for the new (although at least some parishes chant this canon weekly); we are currently chanting the Small Canon to the Theotokos in the Paraklesis service nightly, and giving short meditations on the content of this beautiful prayer. "Lord, enlighten us by Thy precepts and by thy commands; and by the power of Thy lofty arm bestow Thy peace upon us all, since Thou art Friend of man." "Dissipate the gloom of my trespasses, O bride of God, with the clear brightness of thy radiance; for thou didst bear the Light divine which was before all-time." "Heal me, O Pure one, of the sickness which the passions bring, and make me worthy of a guardiancy; and by thy prayers intercessions grant thou health to me." Exorcism of the demoniac son. A very common question and the 2 ways to understand the answer. Synopsis: The story of the exorcism of the lunatic son contains a very important question that all of us ask everyday – "Why?" We ask this question consciously and unconsciously and even dissatisfaction, confusion and ignorance are forms of this question. The solution is given in two parts. Firstly, our Lord tells us but we asked this question because of our unbelief, and the solution to this unbelief is given; prayer and fasting, and, very importantly, our admission of our unbelief and prayer that the Lord will help us to believe. 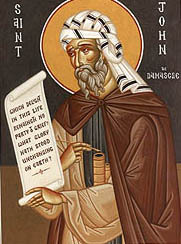 You are currently browsing the Saint Nicholas Orthodox Church blog archives for August, 2011.